After establishing the Best of Elearning! Awards 13 years ago, Elearning! magazine has added the Hall of Fame honor to recognize solutions providers who are consistently improving their offerings to meet the needs of the elearning industry. The first Hall of Fame honorees are BizLibrary and Adobe, who have collectively earned over 100 Best of Elearning! awards across several categories. To learn more about how Adobe and BizLibrary have seen continual success with their solutions, Elearning! magazine interviewed leaders from each organization. Dean Pichee, Founder and CEO of BizLibrary, and Priyank Shrivastava, Adobe’s Director of Marketing, shared details about their solutions’ new and unique features, and how their products are evolving to meet the changing needs of corporate learning and development. Learn more about each solutions provider by reading the full interview here. 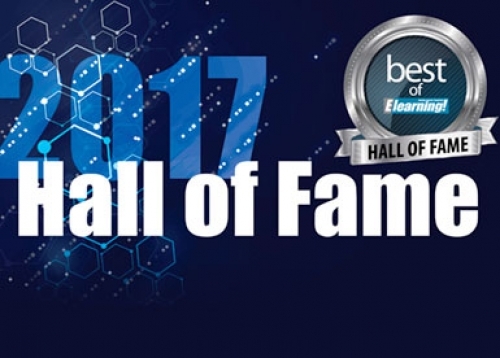 Along with the Hall of Fame recognition, Adobe and BizLibrary each received several Best of Elearning! awards this year. The Best of Elearning! Awards recognizes best-in-class solutions for elearning products and services. Learning executives and professionals worldwide voted on 60 solutions across 20 categories for excellence. This year, BizLibrary was recognized as a winner in the Other Learning Platform and Social Learning Solutions categories, along with receiving an award of excellence in the Soft Skills Training category. Winners for each category have been announced here. Elearning! magazine is the exclusive voice of the $220 billion enterprise learning market. As new technologies develop, enterprise networks are born, and content evolves, you can rely on Elearning! magazine to keep you up to speed. The magazine delivers executives the roadmap for improving enterprise, partner, and employee performance. As the voice of the robust learning and workplace technology market, our audience sees, shares, and collaborates on industry best practices, technologies, and processes. To learn more, visit www.2elearning.com. BizLibrary is a leading provider of online learning for growing organizations. Our award-winning microlearning video library engages employees of all levels, and our learning technology platform is a progressive catalyst for achievement. Partnered with our expert Client Success and Technical Support teams, clients are empowered to solve business challenges and impact change within their organizations. To learn more, visit www.bizlibrary.com.